This entry was posted in 1999, Friday Midnight, Review and tagged caustic humor, horror films, is this a comedy?, midnight screening on July 4, 2015 by jakewalters98. In the modern era, funny films have become almost non-filmic, layering a thick slab of verbal humor on top of antiseptic, unfeeling visual composition and also-ran technique. The worst of the lot don’t even get us that far, barely even introducing “writing” to the mixture and crutching themselves entirely on the often game talents of an actor or two. Comedy sequels, meanwhile, are bottom-of-the-ladder throwaway gags at best, not so much non-filmic as anti-filmic abominations. That they tend to run through the predecessor’s jokes is the least of their problems. That they tend to be actively painful is probably higher up on the list. 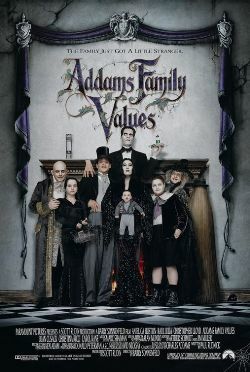 Addams Family Values is a comedy sequel with a difference, and that difference is director Barry Sonnenfeld. Not only Barry Sonnenfeld, of course. Writer Paul Rudnick’s screenplay has a wonderfully droll eye for ’60s sitcoms and a deliciously sideways slant on how to turn middlebrow Americana on its head, and it provides game food for a veritable cornucopia of scenery-tearing actors playing to their ostentatious, blistering best. It’s not quite agitprop, but for a blockbuster comedy with a relatively girthy budget, it plays shockingly recklessly with its audience and comes close to holding its knives right to their face. A great deal of this critique is openly part of the text of the film, with a sub-plot featuring two of Charles Addams’ pugnaciously demented Old Money family members, Wednesday (Christina Ricci) and Pugsley (Jimmy Workman), going to town on the smarmy corporatized Main Street Americana icon that is the summer camp. This entry was posted in Friday Midnight, Review and tagged midnight screening, semi-subversive populism on June 6, 2015 by jakewalters98. This entry was posted in Friday Midnight, Review and tagged Bela Lugosi, german expressionism, horror films, midnight screening on May 8, 2015 by jakewalters98.